Each year I vary my Christmas Tree ribbon methods, trying different ways to decorate with this fancy fabric. Have I mentioned that I start my Christmas decorating early? Of course I have 🙂 You have heard me talk ad nauseam about starting my holiday decorating early in the season…like October! Many reasons for this, but mainly because I put so much effort into the process and assemble so many trees, that I want to enjoy them longer than a few weeks. Christmas is such a beautiful and glorious time of year it deserves a longer period of celebration than a stinkin month (post Thanksgiving to New Years). I try to have all my Christmas decor up well before Thanksgiving, so far I haven’t exactly been able to achieve this, as I tinker and add to my decor well into December. As for the lost holiday of Thanksgiving, the day is not lost at all. Thanksgiving is a day to be celebrated and enjoyed by all you love. I like to incorporate Thanksgiving into my Christmas decor…more on that next week. As for ribbon, anyone notice that stores are not restocking their Christmas decor? Seems to me that the decor you see in October is all there is…and no more, once it’s gone, you are SOL. Have you also noticed how hard it is to find really nice ribbon? I purchase my ribbon early in the season, as soon as it appears in stores..I’m on the hunt! Last year I wrote a post about How to Decorate a Christmas Tree with Ribbon Using Different Methods. I briefly touched on the triple loop method with a hanging tail but this year I want to show you a few more pictures with more instruction. Last year I used this piece of wired ribbon, which is about 2 yards in length, to wrap around the tree. This year, instead of wrapping it around the tree, I created a double -triple loop and tucked it into the tree. It’s a very easy and quick method of tying ribbon. Starting with one end of the ribbon, create a single loop in your hand, don’t leave any excess hanging. Create a second loop of similar size and keep it squeezed together in your hand. Repeat the process with a third loop. Using wired ribbon will work best, and will allow you to create perfect loops than will stay in place once formed. I have a huge canister of assorted cable ties HERE that I use all season to tie ribbon to the tree, garland to the mantle, garland to banister rails and to make bows. They come in varying lengths and can be used for a variety of other projects too. I used a small one to tie the triple loop piece of ribbon together. Leaving at least a foot or longer of ribbon between the first triple loop and the second triple loop, repeat the process for the second triple loop. Make 3 loops and use a tie to secure it in place. Tuck the double – triple loop piece of ribbon into your tree. Stand back and admire your designer work. 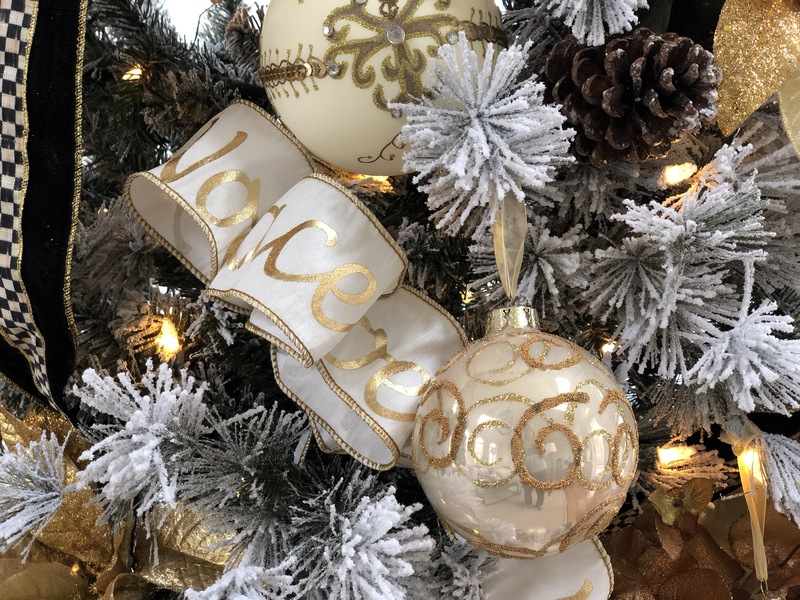 It adds an extra layer of interest to the tree, along with using straight ribbon. Try to use a different coordinating color ribbon than your base ribbon. You can use up to 5 different types of ribbon on your tree without it looking messy. More Christmas tree ideas coming your way. I’ll share a lot more of this room once I have it completed. For more posts about the holidays, subscribe to Happy Haute Home and follow along on Pinterest HERE, and Twitter HERE and feel free to pin and tweet your favorite pics from Happy Haute Home. Beautiful tree!! We are using the same colors!! I may try your double-triple loop this year. I need to go ribbon shopping….. 🙂 I’m curious to know what you used for your topper!! Hi Toya! For the topper I am using picks placed in around the crown, different shapes and sizes, probably around. Will share more pics..I promise! Oh yes! You are rockin’ that Christmas tree! Great job with the beautiful ribbon!